I had a problem when I first paused to stuff pockets with the software advancing a row even though I was outside the left mark, but no issues after I restarted the process and continued. 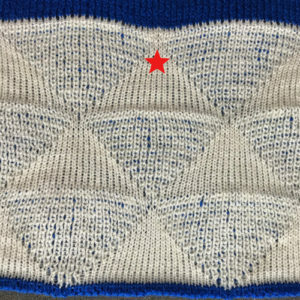 Because the pockets are knitting stitches separately on each bed except for where shapes are joined, the resulting knit approaches stocking stitch qualities and tension settings. 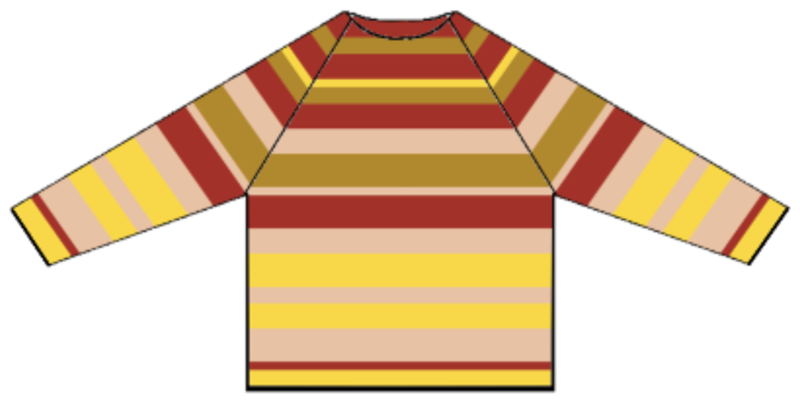 It lacks the stretch of every needle rib, where twice as many needles are in work. 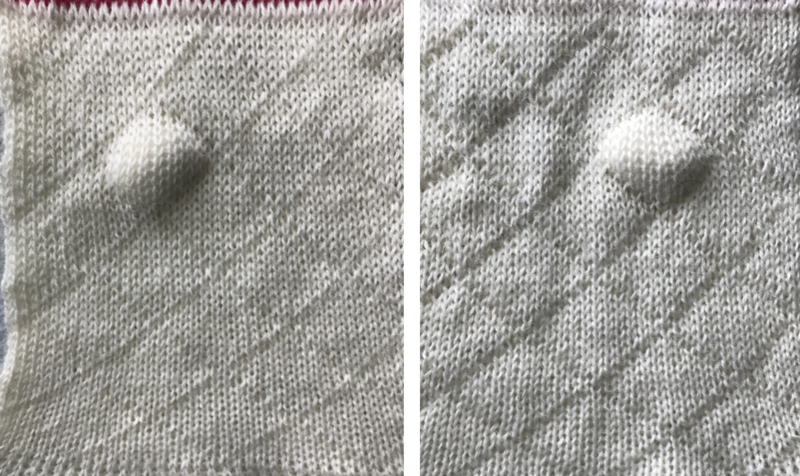 The joins on the knit side (L) nearly disappear unless fabric is stretched, while joins on the purl side (R) are more visible. 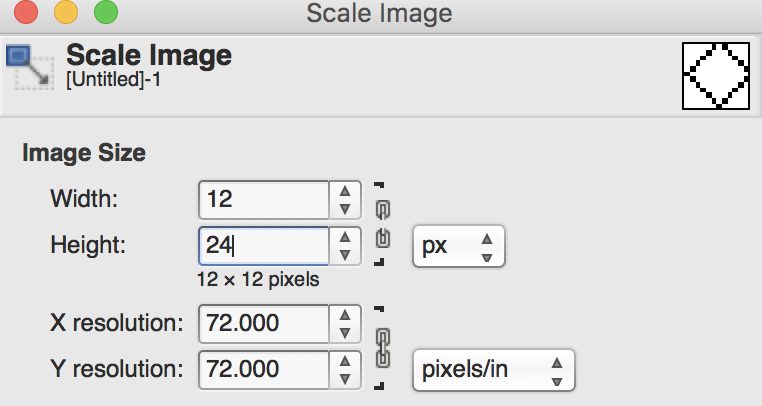 the tiled image will appear in a different part of your screen, it will be the repeat usable for the first preselect row from right to left. 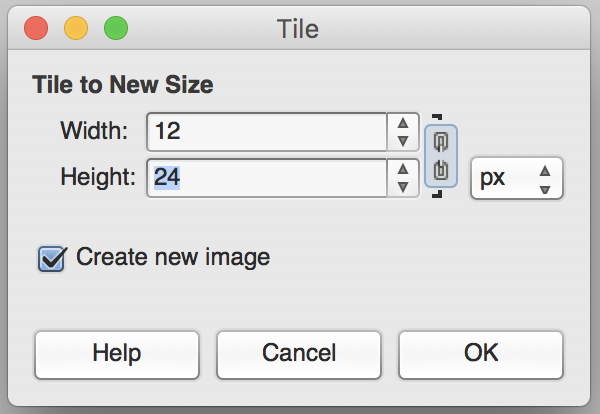 More on using GIMP. 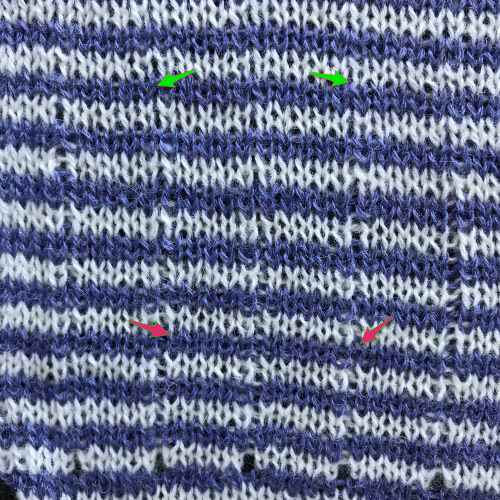 Reminders: no matter what stitch type, if you forget to select proper cam buttons after N/N settings you will only get plain knitting (stripes at bottom of my swatch). 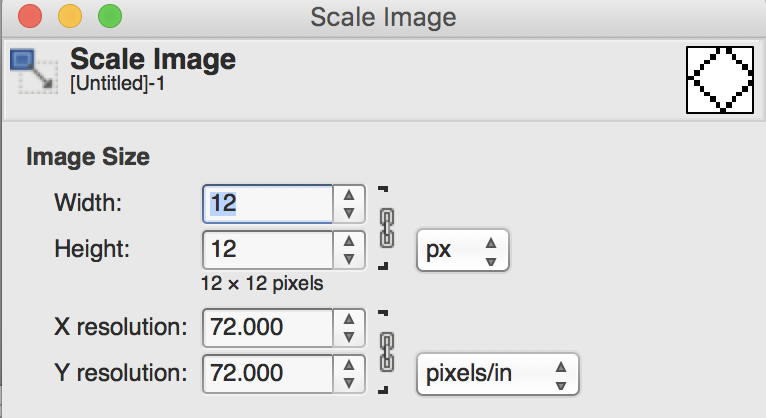 If you are working on a Mac make certain to set your energy saving preferences to insure it stays “awake” for the duration of your knitting time. 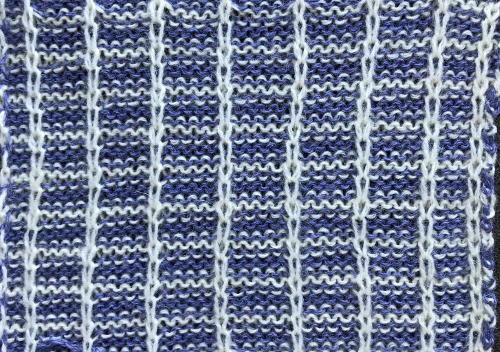 I happened to knit my samples with cam button set to KC II. KC I is the better setting, giving a slightly different seal along the edge away from the color changer. 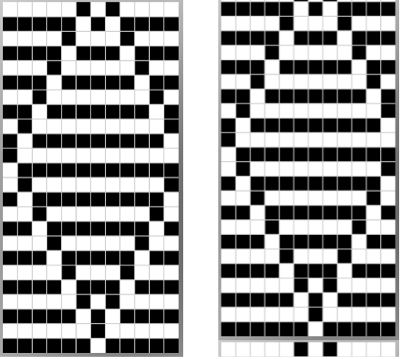 The goal is to had been to use the ayab circular setting to produce quilted fabrics, joined at intervals rather than as an open tube with a different pattern on each “side”. 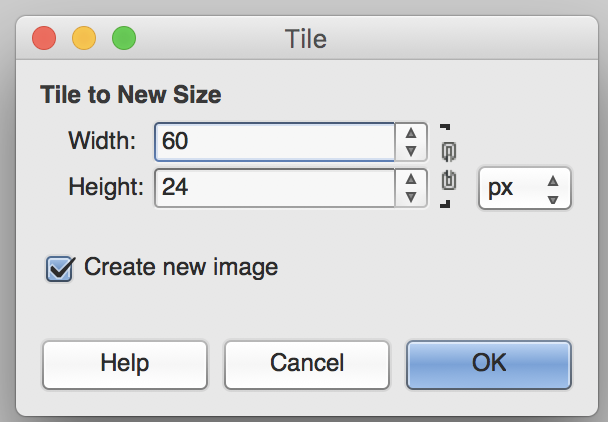 When attempting to utilize anything “off label” for a use other than intended, lots of trial and error can be involved. Ultimately the choice needs to be made as to whether the final technique is worth using simply because you can. 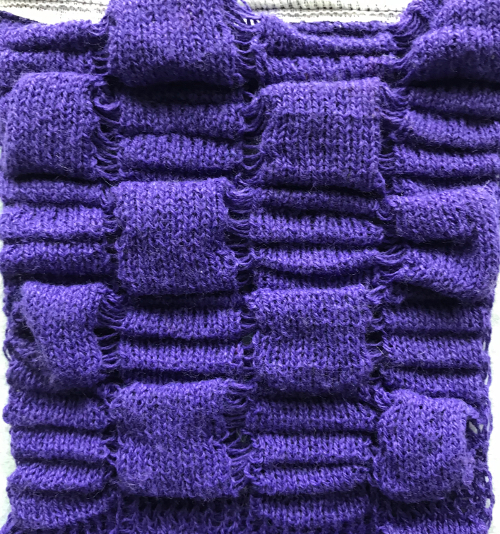 I habitually double check my settings and fabrics at least once, a day or more after I knit my samples and post. The work in progress posts actually show some of the editing as it happens, with corrections and mistakes included. The heading goes away when I think I am done with the topic. 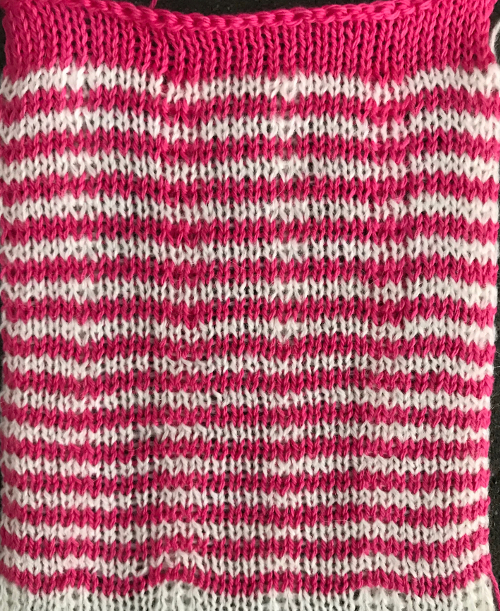 A day after my pink and white adventure I tried to reproduce the fabric with absolutely no success. 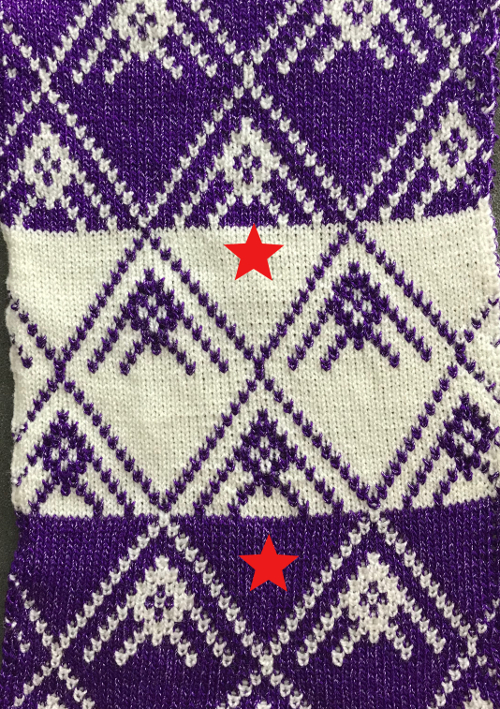 This was as close as I got, with different carriage cam settings, the knit side is shown. 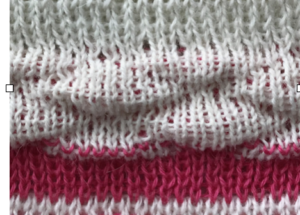 the green yarn is thinner than the pink, so the bleed through of the white on the reverse side is greater. The remaining information applies. My first samples using a single stitch outline, length X 2 for the “diamond” were a disaster in terms of stitches falling off, the fabric being a squishy, shortened mess. 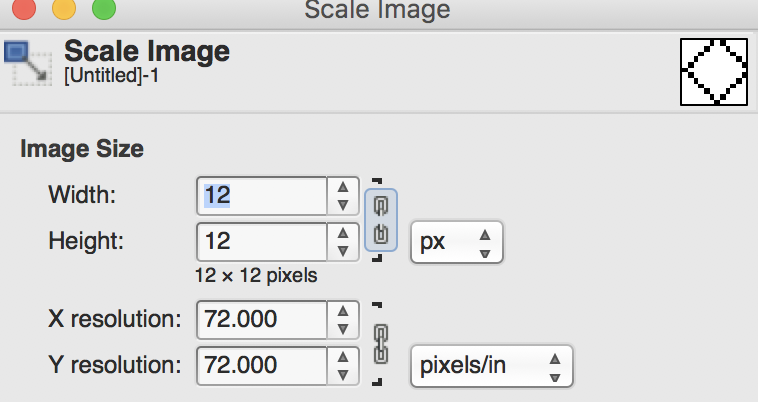 If for any reason you choose to work in color reverse, the black border on each side will be lost. 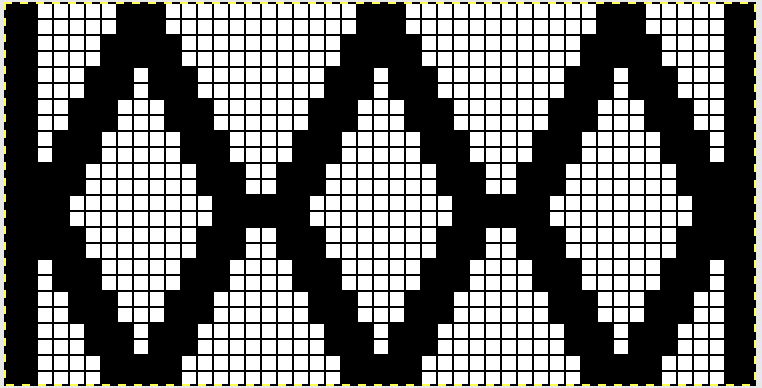 The amended repeat to keep that knit border (black squares/ pixels filled in; this was my working repeat It takes a few tries to sort out what may work. These were my first effort switching ribber settings around until I reached creating pockets. The color choice needs to be made re solid color for backing and sealed areas of the fabric; for me it was the pink. This is where things get a little fiddly. 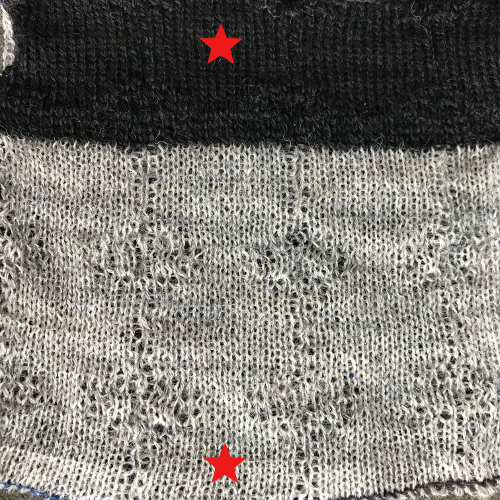 The fabric settings once the first design row is preselected: KC is set to slip in both directions throughout (remember to change main bed to slip if preselection row have been with KC set to knit). 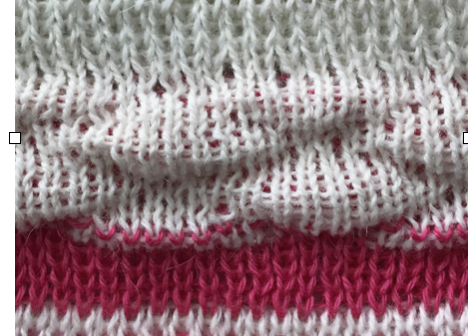 I began with pink for my “sealing” stitches/ solid backing color. 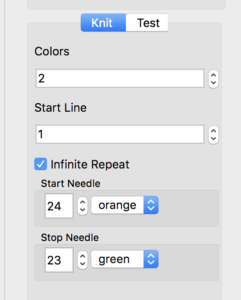 A: setting operator error creating solid color row. 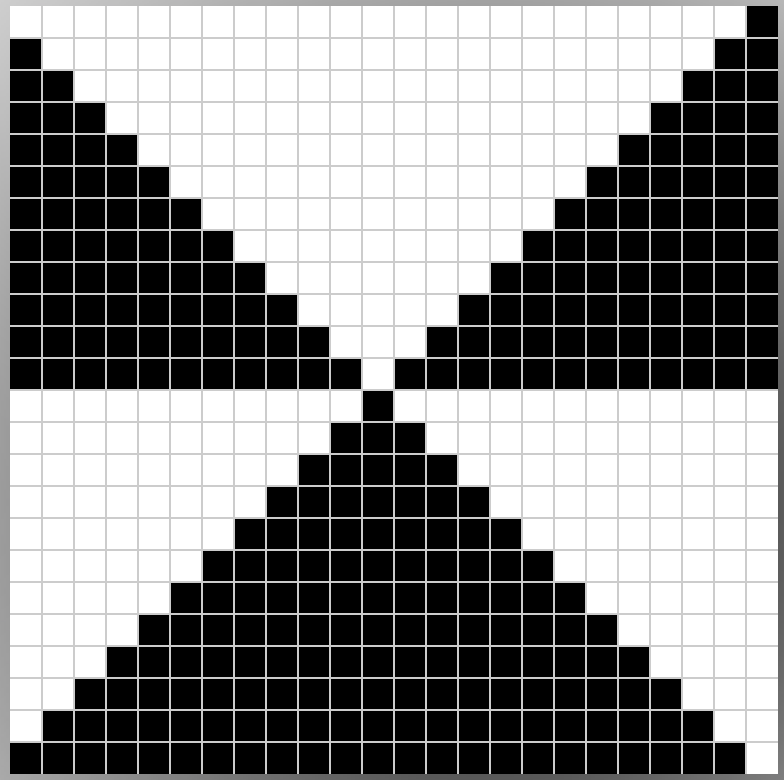 B: same, ribber not set to slip in both directions, resulting in white joining all selected needle. 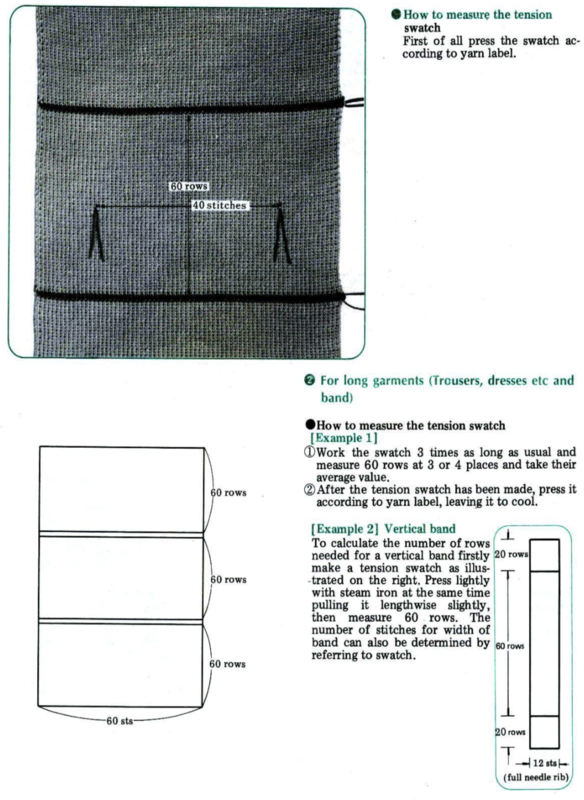 C: stuffed pockets, tending to make fabric wider and shorter A, B: extra sealing rows (2 in white). C: stuffed pockets and a bit of peek through cotton. 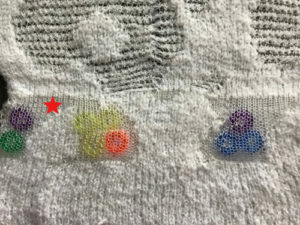 D: points to bleed through backing color of white floats on the inside of the pockets A helpful tune: pink down, white up in reference to right ribber slip lever. 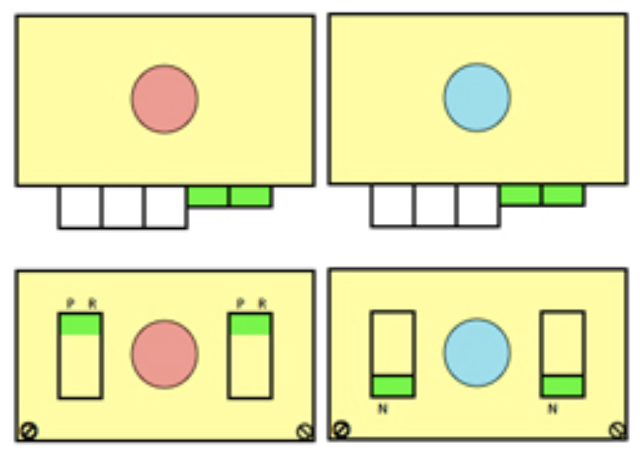 The question now follows: which color separation does Ayab perform automatically for DBJ? 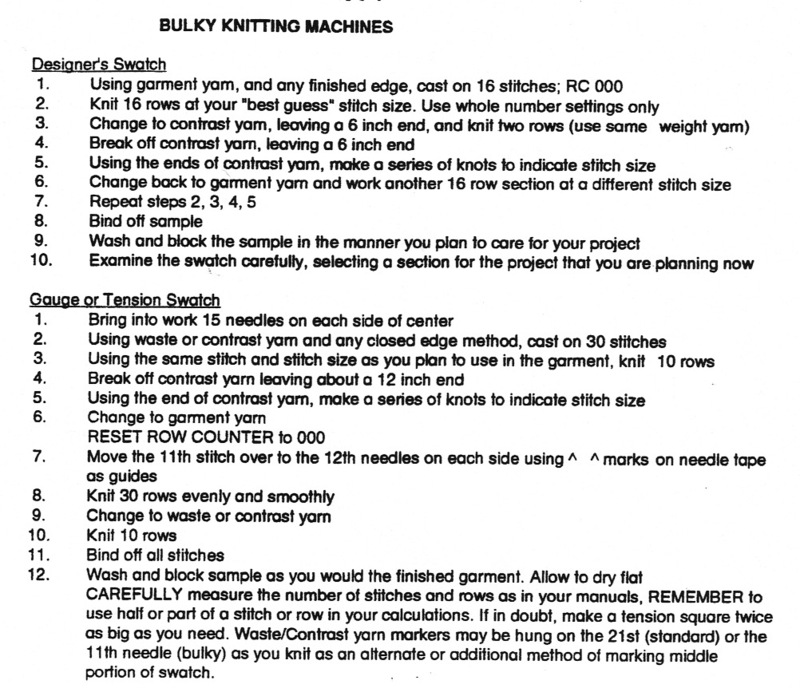 These were the guidelines offered in my intro to machine knitting class for machine knitting swatches to be measured for gauge, or simply to test new yarns or yarns in different colors. 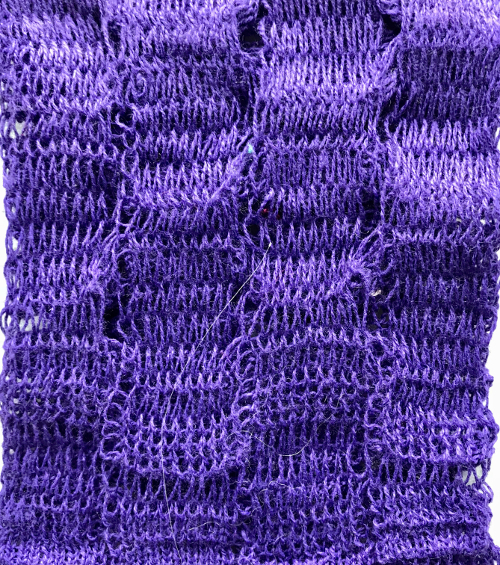 Sometimes yarn from the same manufacturer can vary in gauge even if in the same color but from a different dye lot. 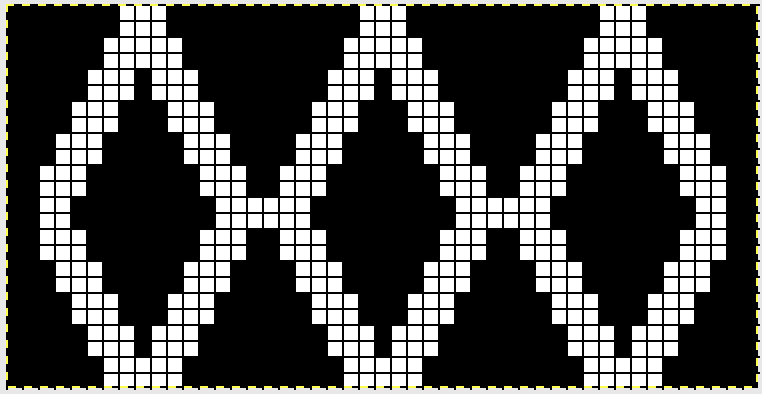 Black is often yarn that has been over-dyed, and may behave very differently. 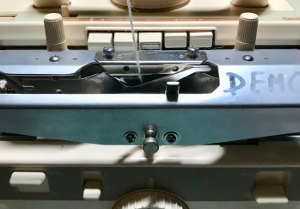 The knit studio was a Brother punchcard lab, with a few 910s available for special projects at the end of the course, or for advanced knitting when offered. 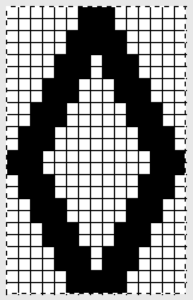 The suggestions work well for single bed knitting on standard or bulky machines for fabrics that are not deeply textured. 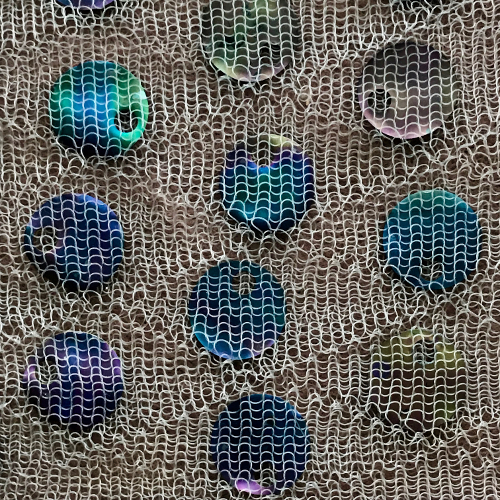 I find with DBJ and highly textured fabrics it is wise to measure much larger swatches if the goal is a predictable size garment or finished piece. 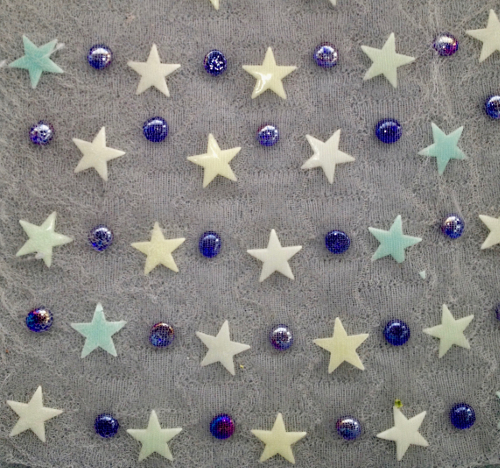 I also got in the habit of checking the marker measurements against the finished piece. 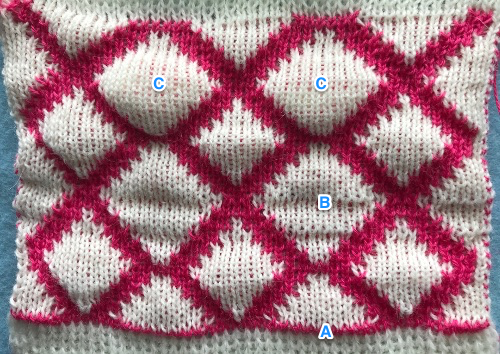 If using a knit leader, the tape used to track your stitches should line up on the width of your swatch in term of counts. 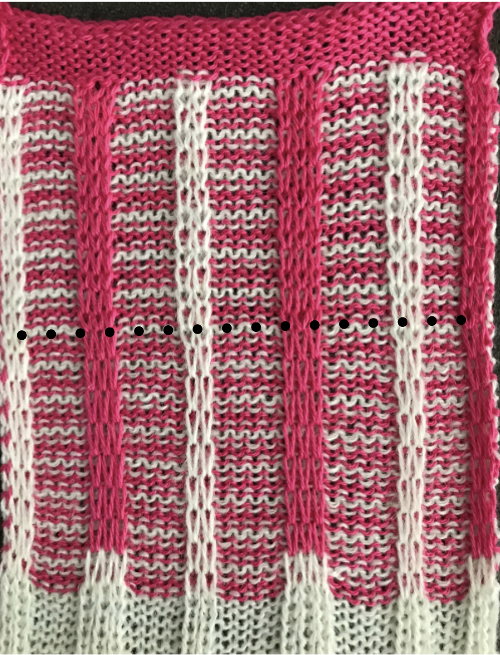 Using truly contrasting colors for the separating rows with tension marks, in equal weight yarn if possible, make the visual measurement for row counts easier. 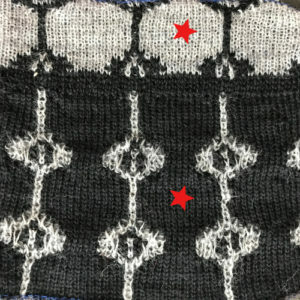 Until one has a good understanding of how stitches are formed, it is good to avoid very dark colors. 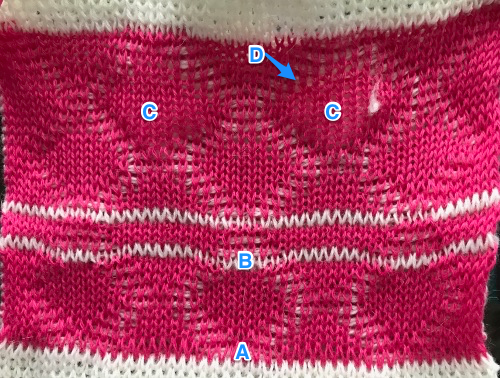 Possible problem areas: stitches may be dropped along areas where fabric is joined (A), sealing side edges (C) will keep them from separating (B). 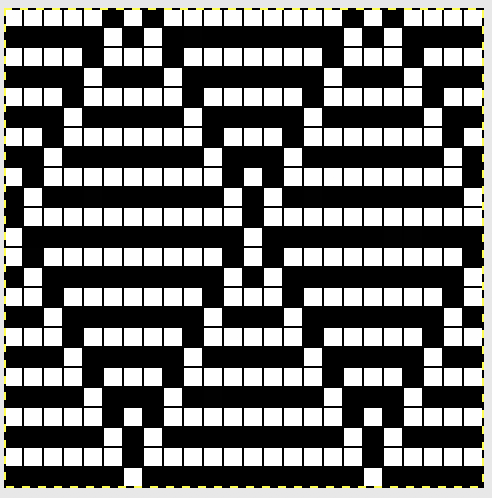 The end needle on each bed must knit the opposite selection as its neighbors in order to close the selvedges. 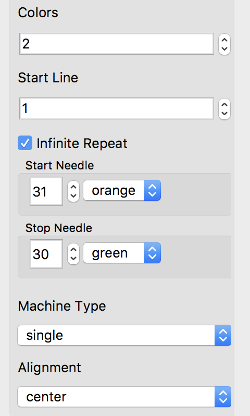 The last needle at the side opposite the color changer may require pushing needles to E manually if not selected by the KM at regular intervals. Blister fabrics and pintucks are cousins. 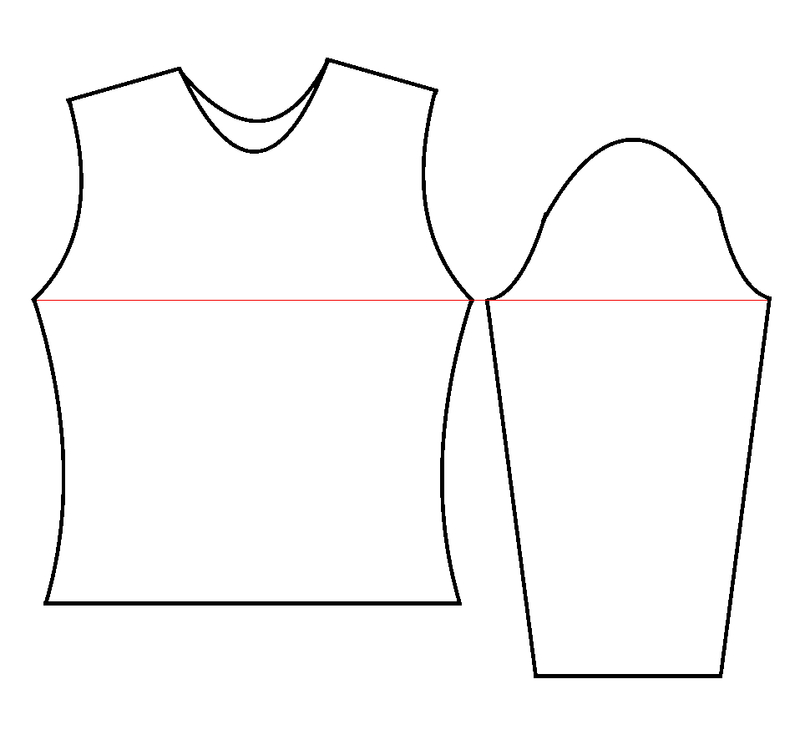 Quilted fabrics are sometimes referred to as “single blister”. 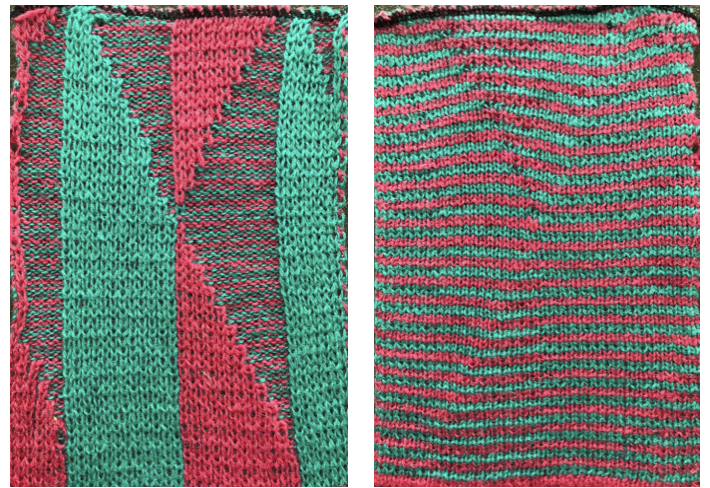 Both rely on one group of stitches knitting more rows than another, can occur both in single color, or multiple colors. 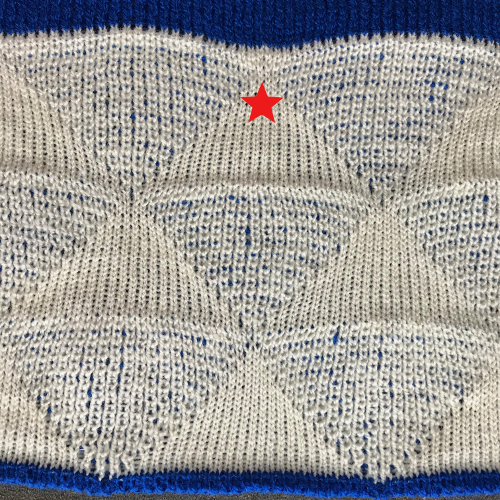 The ribber slips while the main bed knits X number of rows in pattern, and pleats/ pockets are created, eventually sealed by knit stitches on both beds. 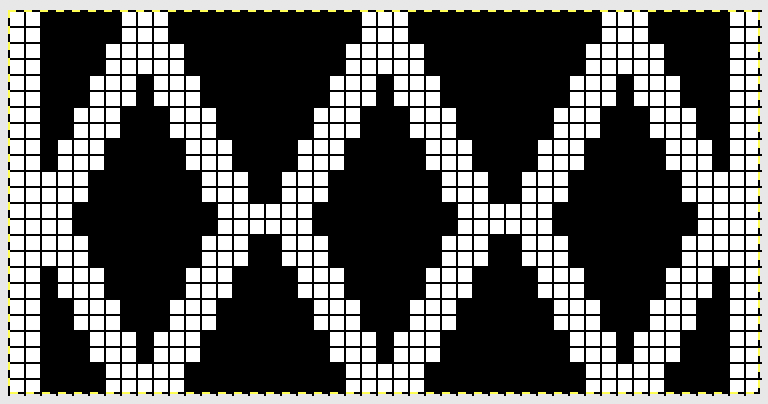 The number of rows for which this action may be taken in Brother machines is far more limited than in Passap, where the strippers help keep fabric in place. 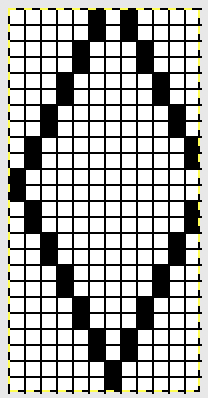 Single color pintucks/ blisters began to be addressed in my post, which reviewed Brother ribber techniques suggestions. 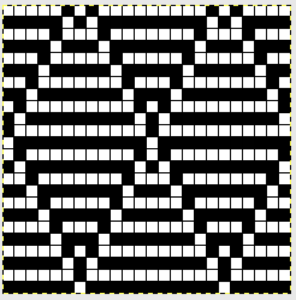 A multiple row blister sample executed on Passap, in turn programmed from and ancient DUO 80 magazine, eliminating hand selection on back bed, and programming it in terms of black and white squares on the front bed. My E 6000 manual is annotated extensively, and my scribbles make a good argument for keeping better notes. I immersed myself in learning the machine when first purchased. 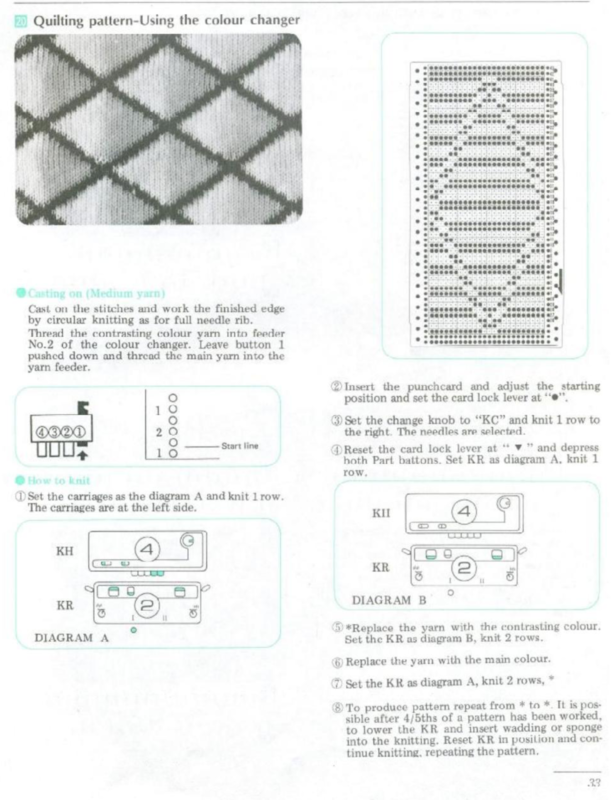 The technique for solid color backing, tubular FI illustrated in the manual, is a workaround to create “quilting” “automatically”. 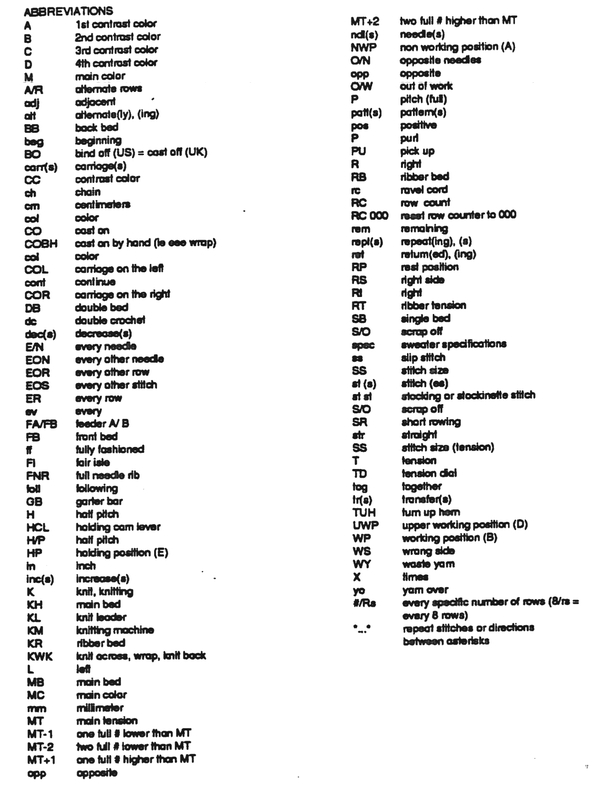 A bit of translation and a different set up from my working notes is offered after the scanned image. 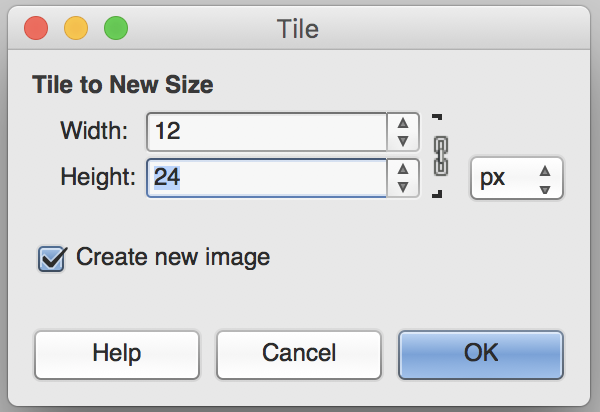 The circular setting in Ayab software performs the same automatic color separation. 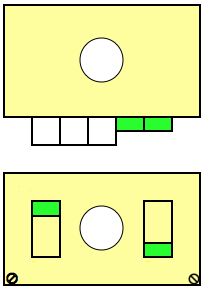 With this arrangement, pouches will be formed on the white squares of the card. 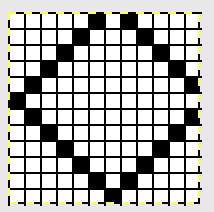 If you think in terms of the colors of the squares, then it is not important which color is determined as the background color by the console. The set up may be different in your copy of the manual. 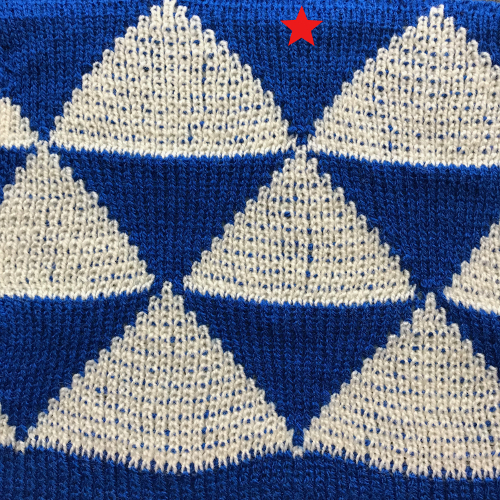 Knitting four consecutive rows with either color reverses the position of the colors in the pattern. 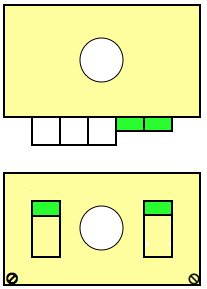 Each 4 passes of the locks complete one design row. 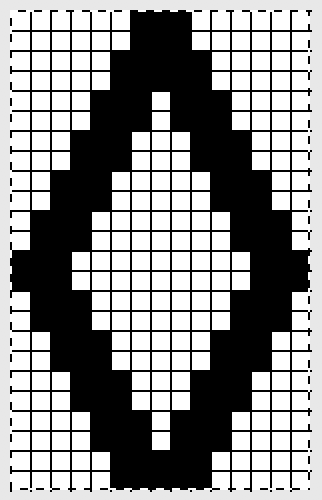 Reversing the BX <— pusher selection (manually, on right, prior to color change), will reverse the areas quilted. 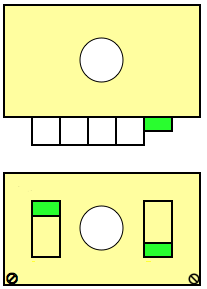 The first pushers on both left and right are aligned in the opposite position to rest. 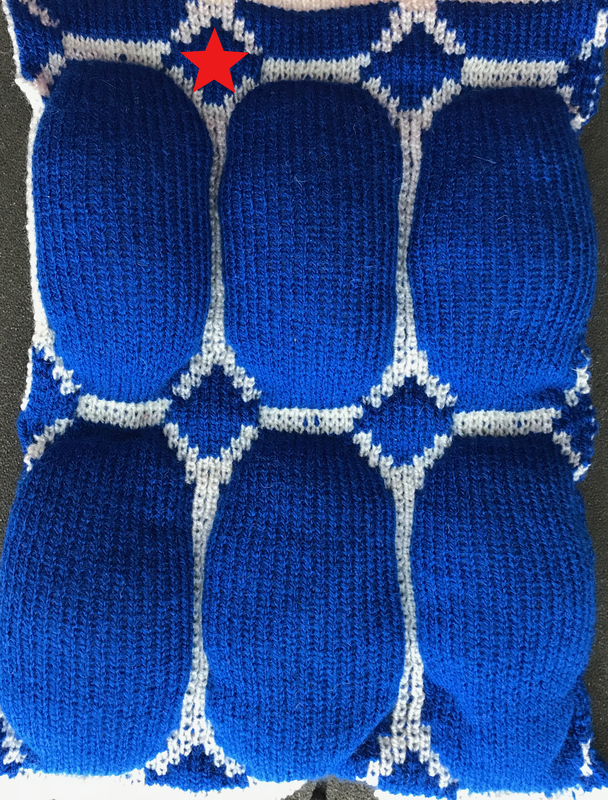 Floats are created between the layers by the color not knitting on the back bed, and the altered pusher position will keep them from jumping off. Depending on the size of the pockets you may want 2 pushers in that position rather than one. 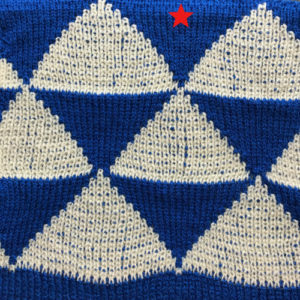 Always swatch before you commit to a large piece of knit. 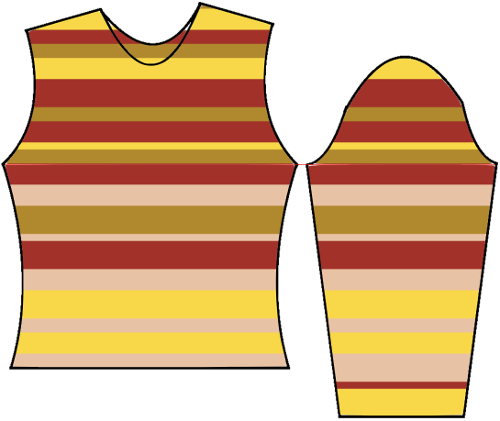 The identical design methods as those offered for Japanese machines and the associated fabrics may be reproduced by entering the separations as a pattern and then in turn entering technique 129. 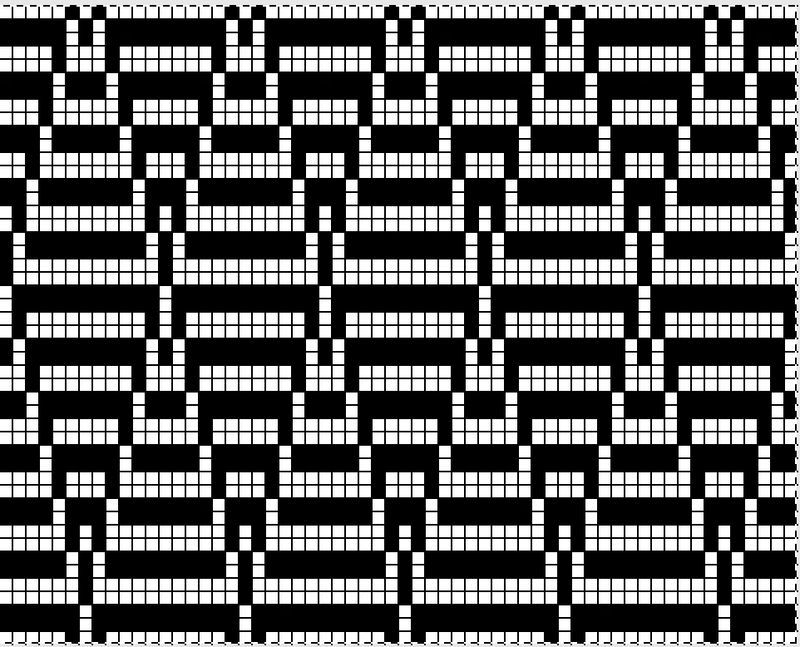 The PDF suggests a method for using Japanese designs as drawn on punchcard knitting machine in an E6000. My scribbles from my Passap manual. The console and manual recommendations are only guidelines. 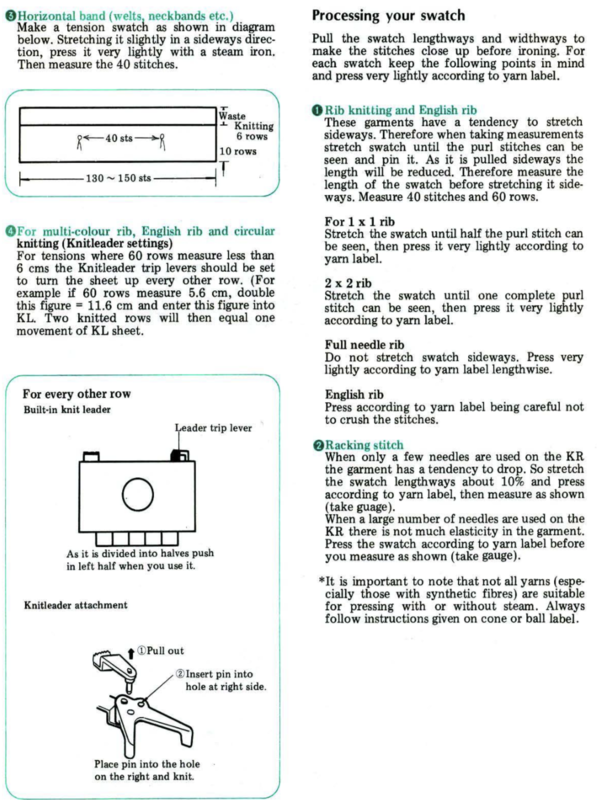 Any and all technique lock settings may be altered to suit planned fabric, and if the machine offers beeps and reminders for the factory program, simply disregard them. 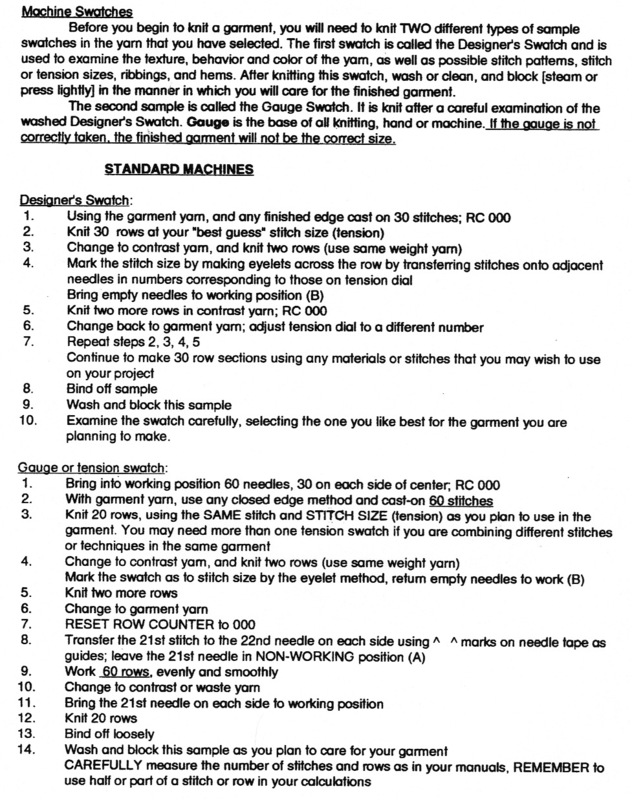 Double bed work requires at least 80 stitches by 100 rows for gauge testing for finished garments. 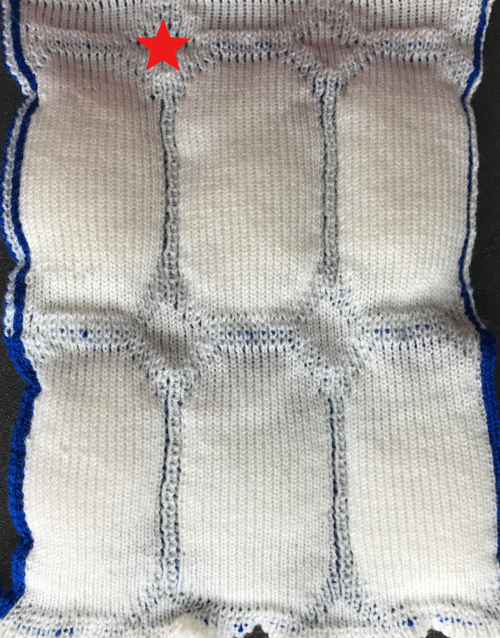 Any machine: for blankets or warm jackets, the pockets may be filled with padding every X # of rows, the front bed may be dropped to make this easier. 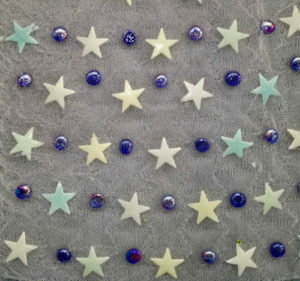 Mono filament and /or fine wire may produce structures which have objects “dropped” into pockets ie marbles, sequins, sponges that will expand into the space when wet with fluid, etc. While working on a later post on knitting this fabric using Ayab software in a hacked 910, I found using a simple single pixel height per row diamond shape outline, elongating it X 2, and working in the circular setting produced the single color quilted fabric with no other fuss ie. a color separation. 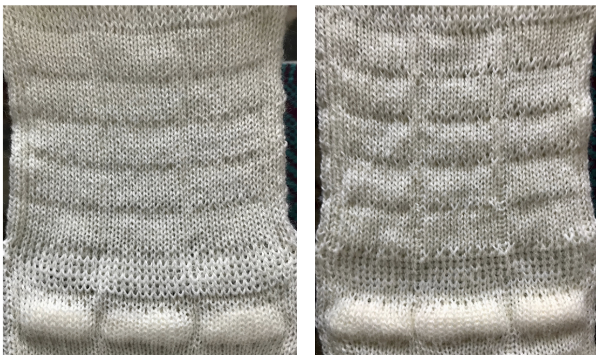 Below is the working repeat for use with first preselection row from right to left, knit with right slip button on main bed, left slip button on ribber throughout. 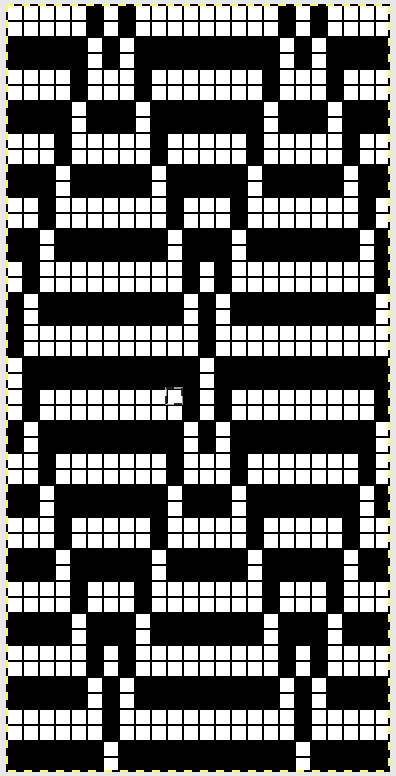 The same settings and approach should work in punchcard Brother machines. 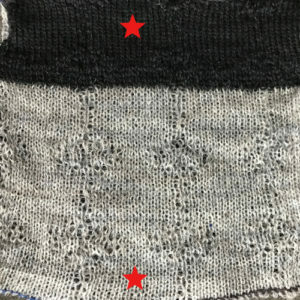 Periodically questions come up with regards on how to manage float control other than using familiar DBJ settings, or the best way to proceed to achieve it when one prefers to work in thicker yarns. 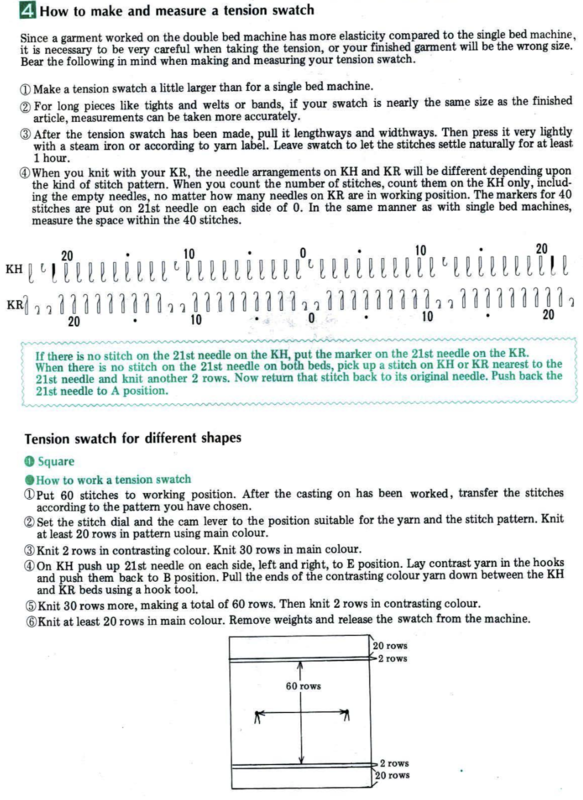 In this technique all main bed needles are in use for patterning and in working position, the ribber needles can be arranged in nearly any configuration in groups with 1 needle in work, and one or more needles out of work. The main bed tension is close to what would normally be used for single bed fair isle, while the ribber is set at least one or two whole tension numbers tighter, thus reducing bleed through or vertical separation lines on the “outside” of the knit. 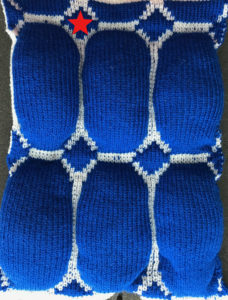 The fabric uses less yarn than every needle rib DBJ, is lighter in weight, has more stretch, but will not lie as flat. 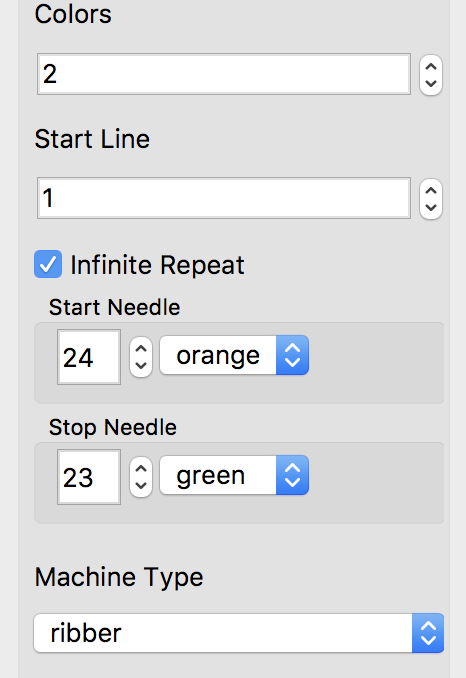 In Brother, if needles are arranged in groups of 2 (pairs of lines and spaces on the needle tape with even spacing between them (i.e. 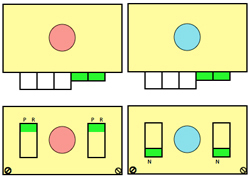 2 X2, 4X4, 2X4, etc) then lili buttons can be used. 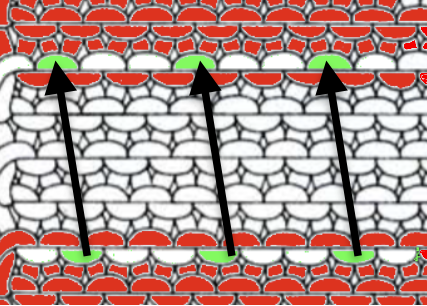 The latter method has less chance of the backing showing as a vertical line/ separation on the pattern surface. 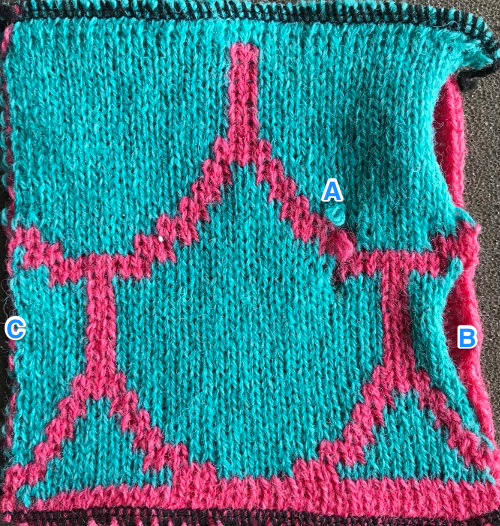 Sometimes the ribber needle arrangement may result in a secondary, interesting pattern on the purl side. 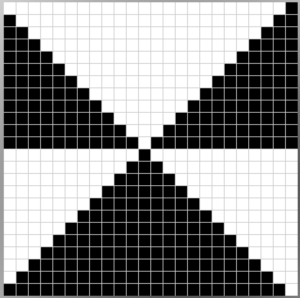 It is still a good idea to have floats that are limited in width, generally less than 5 stitches`. 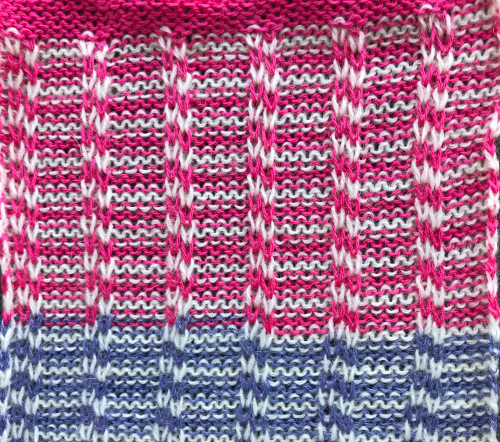 For the purposes of illustration, I knit 2 row stripes on the main bed, while altering settings on the ribber. 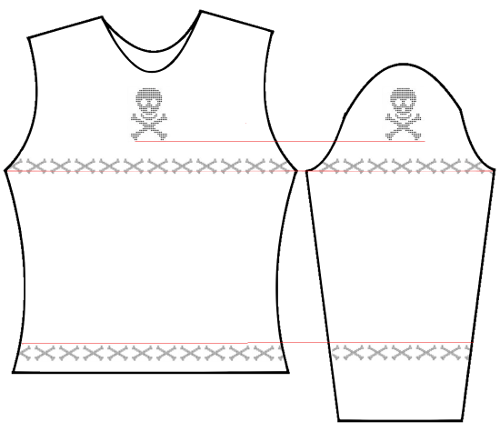 If empty needles are simply brought into work above plain knit rows, eyelets will be created. 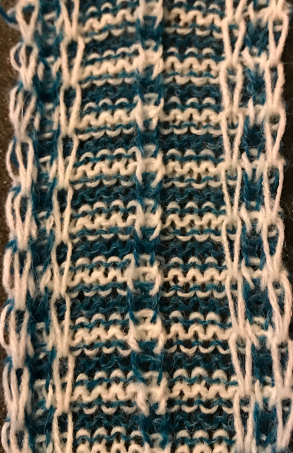 One way to reduce their size would be to pick up loops between stitches on the main/ opposite bed, and use them to “cast on” your ribber needles. 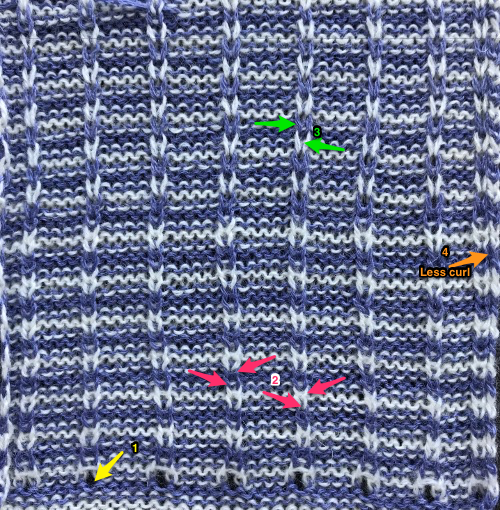 With ribber carriage set to knit in both directions, each color will knit with each pass of the carriages (2). 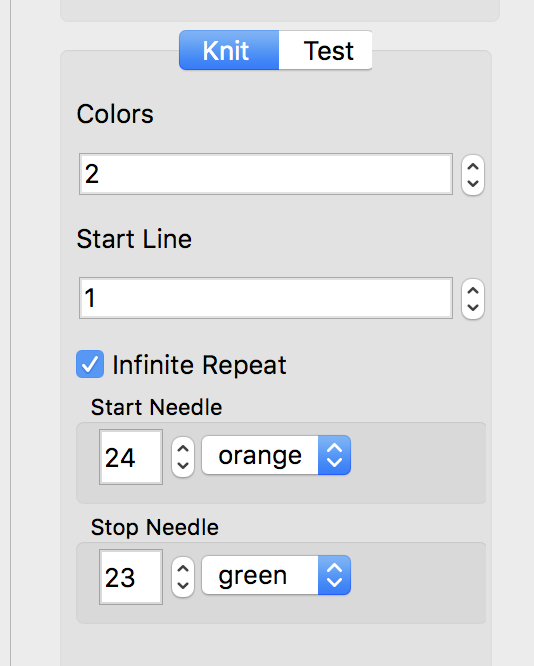 There are 2 options: one is for bringing appropriate needles to E position for each color only once. 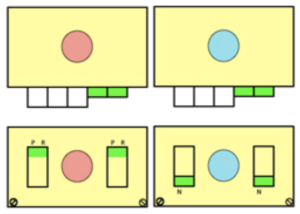 I chose to do so immediately after each color change, with carriages on the left (below dots). 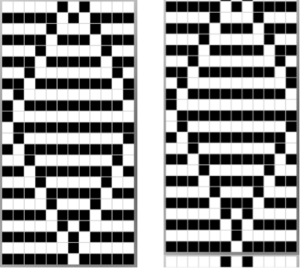 The other is to to bring them to E for the second pass of the carriages on their way back to the color changer as well (above dots). 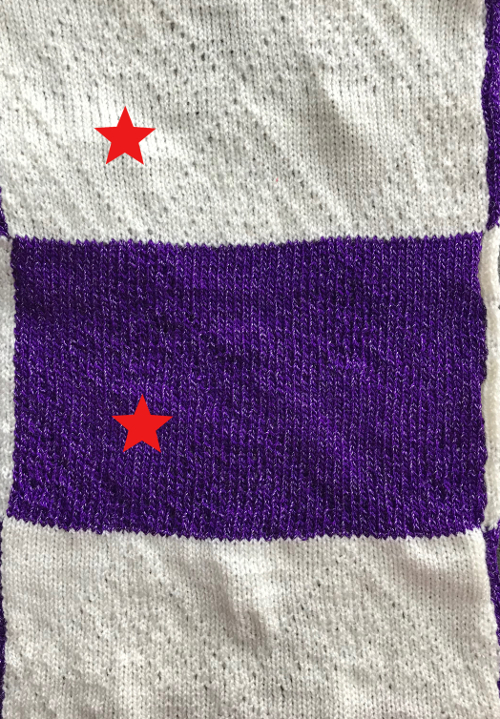 There is elongation in stitches in both options, less so when each color knits on the ribber for 2 consecutive rows, where one short and one longer stitch for each color may be observed. 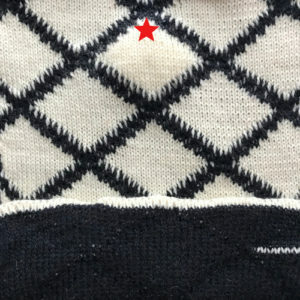 The first option also caused a bit of puckering on the knit side, which disappeared with pressing.